At least once a summer, I read a Nancy Drew mystery. The only reason I wanted to go to school was to learn to read so I could read Nancy Drew books all by myself and not have to depend on my sister to read them to me. Nancy showed me how mysterious and exciting life could be and how great it was to help people in trouble (even if you often got chloroformed or kidnapped or knocked on the head). The books taught me about a time already intriguingly out of date when I was reading them in the 1950s and 1960s. Those 'roadsters'! Those 'frocks'! 'Tea rooms'! They weren't dumbed down, so there were words I had to look up, new words to learn. For just a few hours, I can pretend I'm 12 again, sitting on the Virginia Creeper covered porch with a cold Coke and a bag of chips, whiling away a summer afternoon. I spent a great deal of time sussing out non-existent mysteries in my neighborhood. I eventually graduated to wanting to be Mrs. Emma Peel, from the TV series The Avengers. Again, I fell sadly short of my ideal. I only read and enjoy the older books, not the 1960's rewrites or the later yellow back editions. I've been quietly collecting them over the years, but the values have been creeping up. 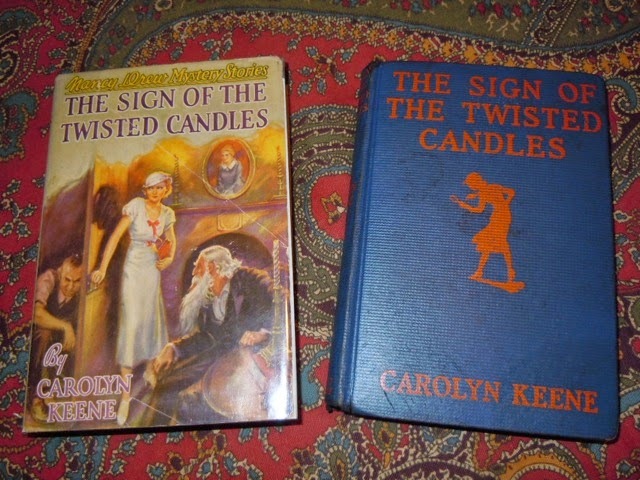 Here are two editions of The Sign of the Twisted Candles, the book I just read. The contents are identical, but the editions are different. 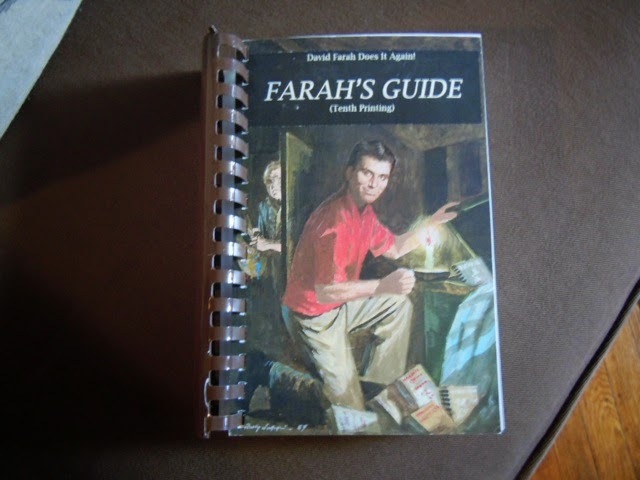 If you really want to get into collecting Nancy Drew books, the reference book you need is Farah's Guide, a chunkster of a book by David Farah, who apparently has no life outside of Nancy Drew. 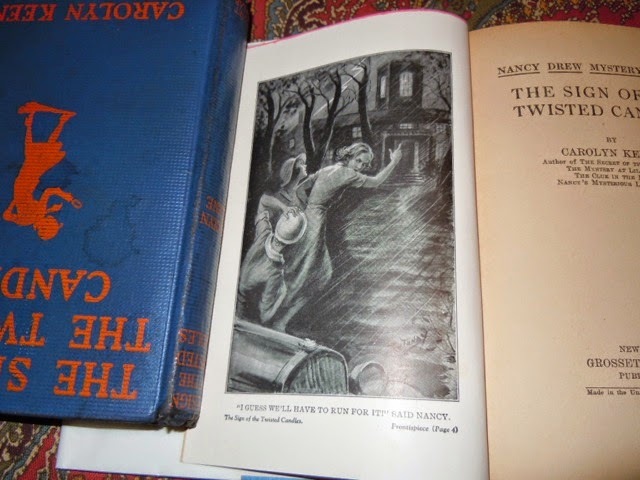 Nancy Drew books were reprinted frequently, but the publisher didn't list the print dates, only the original copyright date. Other than physical differences, you can't tell when your book was printed. Farah has researched hundreds, maybe thousands, of editions and put together this guide to unraveling the ages of your Nancy Drew books. 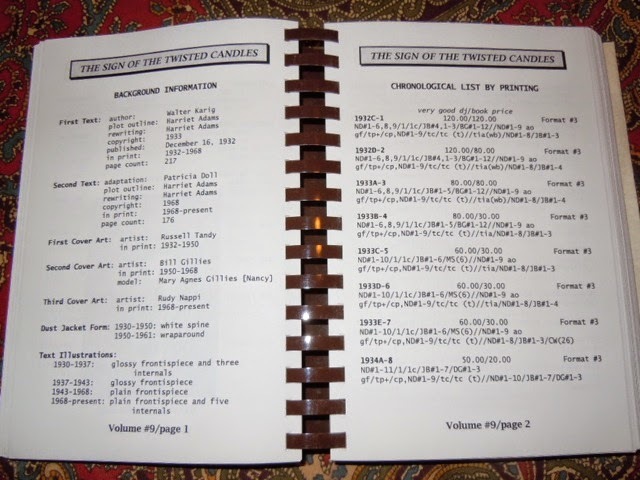 The section on The Sign of the Twisted Candles alone is eleven pages long! Things like this confuse me, so I've never been able to tell with any certainty when my books were printed. 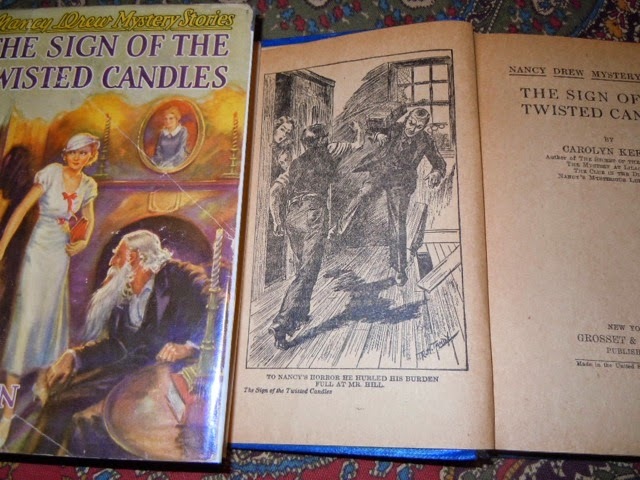 I also have both editions of the Nancy Drew board games, one from 1957 and one from 1959. My sister and I had one while growing up, but it disappeared from the attic at some point. I bought one and found another for my sister, I think one of the best presents I ever gave her. Occasionally, I get mine out and my husband will trounce me - every time. I still love moving the little metal cars around Moon Lake, The Haunted Bridge, The Moss-Covered Mansion, and other places from the books. While chatting with my friend Katrina (http://piningforthewest.co.uk), I mentioned that I'd just baked some Surprise Muffins. They're masquerading as Mystery Muffins in the title of this post. She asked for the recipe, so here it is Katrina. (It's from an old Betty Crocker cookbook.) Let me know if you can't read any of it. I use the Popular Muffins version because I don't have much of a sweet tooth and the Sweet Muffins are too sweet for me. I'm also a vegan, so I substitute soy milk for dairy milk and I use an egg substitute that I make myself. It's noted in my barely legible handwriting on the recipe. I just realized that I cut the 'surprise' part off the recipe. 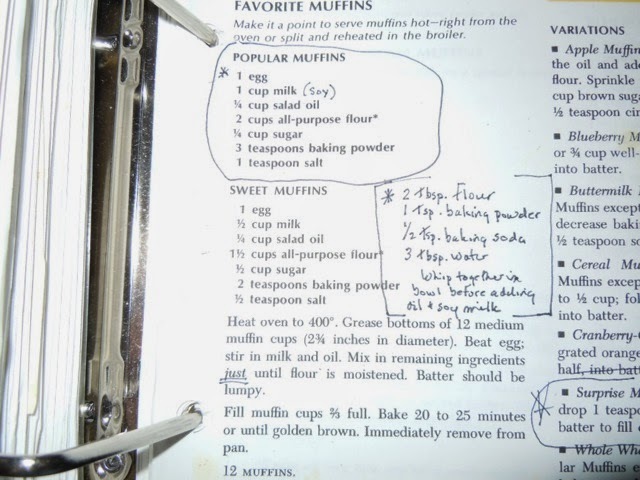 The surprise is that you fill the muffin papers half full, put a teaspoon of your favorite jam or jelly in the center, and then fill with the rest of the batter. Surprise! I've been reading The Count of Monte Cristo for months. It's a good story, but reading so slowly, I've forgotten who some of the people are, especially because they're called by different names at different points in the book, and I'm not sure if I remember all the plot details. I know it's about love and revenge. And it's exciting. But what I've discovered is that I should not be reading this on my beloved Kindle. I love my Kindle because it's easy on my arthritic thumbs. I no longer have thumbs of steel, capable of holding open even the newest, unbroken-spine book. But after reading 40 pages on my Kindle and only advancing 1%, I got discouraged. Was this book 4,000 pages long? Was the book getting longer? There seemed no end in sight. I need more encouragement than that. 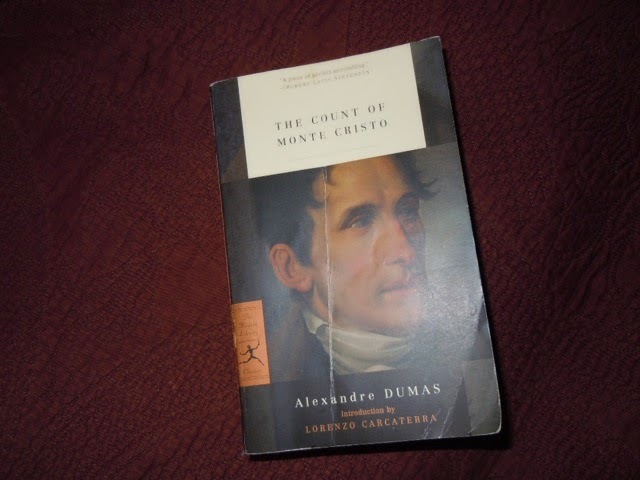 So I went to my favorite used book store, The Book Trader, and found a wonderfully floppy Modern Library paperback of The Count of Monte Cristo. The book lies in my lap like a happy cat. No need to hold it open with my sad thumbs. 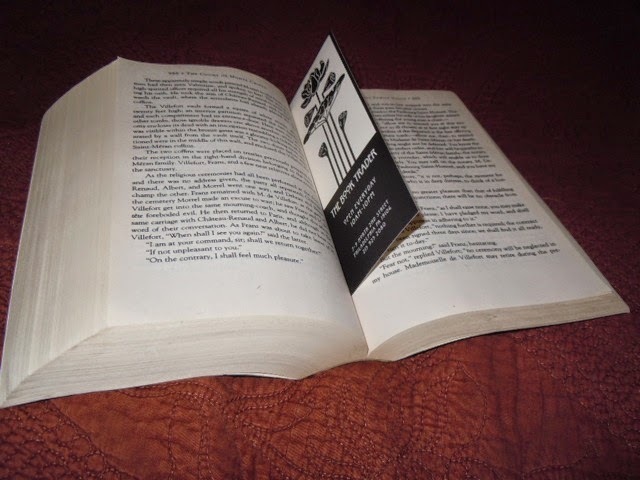 Better yet, after reading, I move my bookmark farther into the book. Yes, I am actually making progress! I'm clearly a donkey and carrot kind of person. I'm now 989 pages into the 1,462 page book. No longer will I torture myself reading chunksters on my Kindle. My Kindle's great for normal size books, for reading in bed, for taking along on vacations or while waiting for appointments. But, as far as reading on my Kindle, size matters. At least for me. I finished Wild about an hour ago. I didn't like the detailed description of the author's mother's death from cancer, but it is an integral part of the book. I've spent enough time in hospitals and nursing homes watching people die, so, forgive me, but I stay away from that subject matter in my reading. However, the adventure that Cheryl Strayed had hiking the Pacific Crest Trail alone in 1995 is fascinating. I couldn't put it down. Bon Courage wasn't very satisfying. The author and his second wife vacationed in France after a whirlwind courtship and marriage. They buy a house in the village and have all the typical problems renovating it, plus some problems that aren't so typical. I like books about living in foreign countries, but I didn't like this author very much. He's grumpy and yells and drives off on his motorcycle after he and his wife have a fight. I read Darkness Take My Hand while Jack and I were in Boston. Dennis Lehane is from Boston and his six books about private detectives Patrick Kenzie and Angela Gennaro take place in the city. I don't know Dorchester very well, the section of the city they live and work in, but I have fun recognizing other places when they venture out of the neighborhood. The books are exciting and I like the main characters. It seems that the pair are not very good at protecting people from being murdered, though. My friend Dean says they must be read in order, so I'm doing that. This one is number 2. I've been waiting eagerly for the next Clare Fergusson / Russ Van Alstyne mystery and yet, somehow, Through the Evil Days slipped past me last year. These mysteries should be read in order, too, otherwise it might be a bit difficult to follow the progression of the relationship between Clare, an ex-military helicopter pilot turned Episcopalian priest, and Russ, the police chief in a small upstate New York town. In this one, Russ and Clare are trapped in an isolated area by a huge snow storm that's also trapped kidnappers and meth cookers. India Black was a fun romp through politics and prostitution (wait, aren't they one and the same?) in 19th century England. A politician dies in India Black's bordello and some very important papers disappear. An agent of the government is trying to find them before they harm the country. He enlists India's help. They embark on a sometimes ludicrous chase, getting the papers, losing the papers, getting the papers, and losing them again! There are more books in the series but I doubt that I'll read them. The Preacher was a decent mystery that kept me guessing until the end. Girls disappear and their remains are found, just like years ago. But that murderer is dead, so who's killing them now? Borderlines takes place in Vermont's Northeast Kingdom, a place with lots of trees and not a lot of people. As a former New Englander, I like books that take place in my old stomping grounds. Joe Gunther, acting chief of the Brattleboro, VT, police, goes north on a temporary assignment and finds himself searching for a killer. Or two. The Santa Klaus Murder is a reprint of a 1930s mystery. I wanted to like it, but it was very slow. I suppose I'm used to the faster, more complicated murder mysteries of today. The solution to this one had everything to do with who was where at the time of the murder and who benefitted from the will. Most of the book was spent tediously discovering and verifying where people were, like a very long and uninteresting game of clue. Major Benjy continues the wonderful Lucia and Mapp series by E. F. Benson, this one being written by contemporary author Guy Fraser-Sampson. I adore the Lucia and Mapp books. Although this one captured some of their flavor, it fell short for me. All Mapp, no Lucia. I also have Lucia on Holiday by the same author and I still plan to read that. I love art mysteries, so I enjoyed The Art Detective. I was a little put off at first because it's mostly about paintings hidden beneath other paintings rather than art hidden in someone's attic or in a cave (yes, I loved The Monuments Men). But the detection involved in sussing out masterpieces that have been painted over or altered to the extent that the original artist can't be determined is very interesting. And last but not least, the newest Donna Leon Inspector Brunetti book, By Its Cover. Brunetti is contacted when rare books and pages from rare books are stolen from a private library in Venice. And then someone is murdered. Brunetti figures it all out. I was holding my breath when I started this book because I haven't really liked the last few Brunetti books. I like his wife Paola and what they read and their meals and when they sit together on their balcony drinking ice cold wine or grappa, so I'm disappointed when there's not a lot of that. There's more in this book than in the previous couple, so I was happy about that. Maybe Paola should have her own books! I'll try to do updates more frequently so they aren't as long as this one. Happy reading! 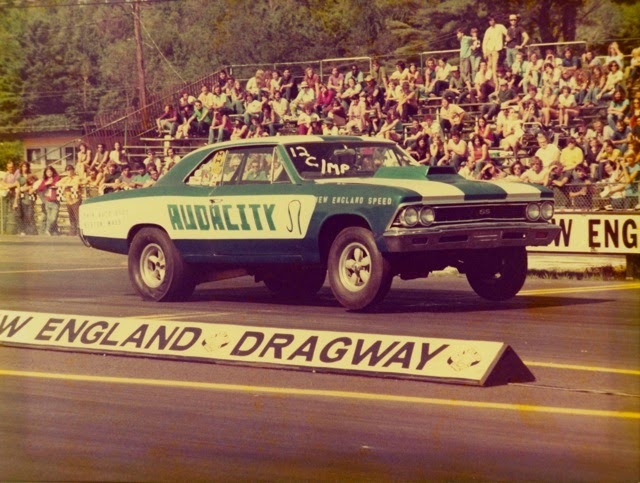 Sundaaaaay at Beautiful New England Dragway! I was a wild child. More of a wild young adult really. I was about 18 when I stopped reading about life and started living it. 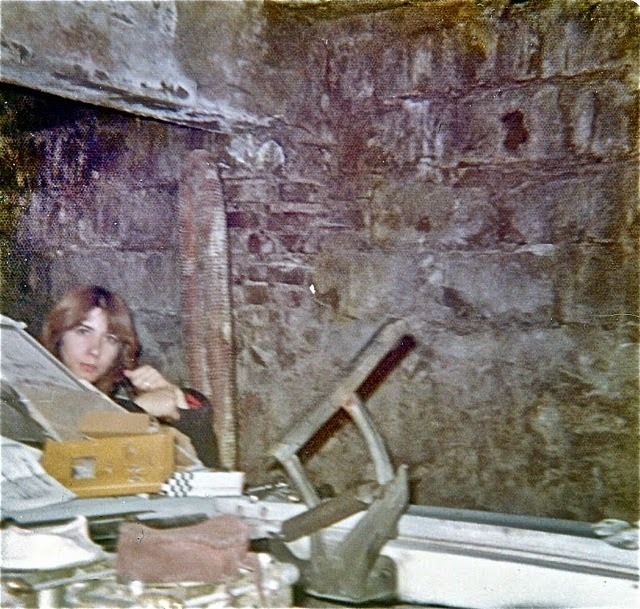 I never gave up reading and often showed up with a book at unusual or inappropriate places, like parties. I wanted to taste as much as I could, but I was likely to be the one in the corner reading and keeping one eye on what was happening around me. I got an eyeful. I met another wild child. More of a wild man, since he was eight years older than I was. I had been warned about him. 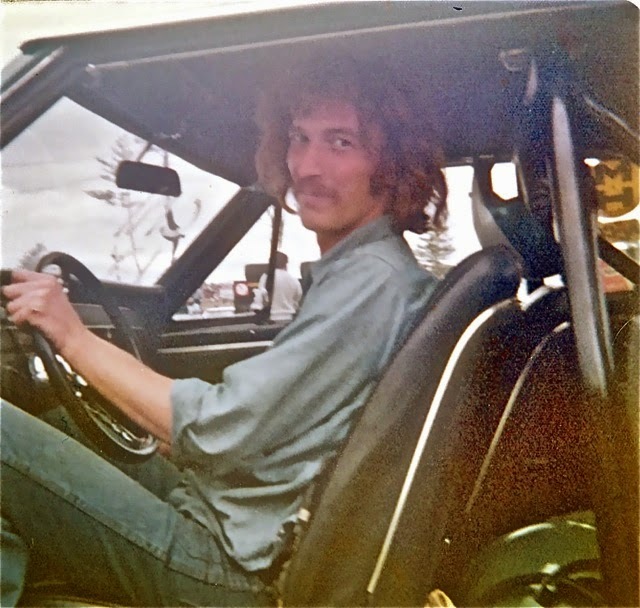 He was an auto mechanic and loved going fast. He had long hair and played the guitar and had a reputation. He built drag racers, too. I was fascinated and fell hard. When he moved to Boston, I followed him. We turned my 1966 Chevelle SuperSport into a C-Modifed Production drag racer. Every Friday, we and our roommate Kevin towed the car to Epping, New Hampshire, to New England Dragway. Here's a YouTube clip of a radio advertisement for N.E. 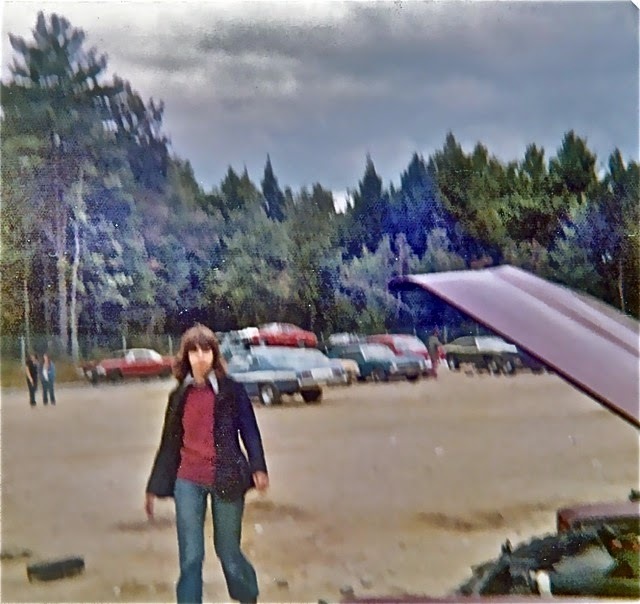 Dragway from 1973, the time we were there racing: https://www.youtube.com/watch?v=cygj3MNMU-c Here's a photo of me working on the car as we rebuilt it. This is a photo of my car after we had taken it apart and put it back together, welded a roll bar in it, painted it, and installed the racing engine that Jack built (over 500 hp) and other racing parts (shifter, transmission). We did everything possible ourselves. We drew names from a hat and Audacity won. Unfortunately, the track announcer pronounced it 'Auto City' until I set him straight. And here's that wild man, now my husband of 40 years. He was delighted when people told him he looked like Ginger Baker, the drummer from Cream, one of his favorite bands. Yeah, I know, but it was the early 1970s. And here I am, walking away from the car. We slept in the car or on the ground or in the tow truck. I had to share the public ladies room with other girls at the track. How did I do that?! How did I go three days without a shower?! How did I manage to eat?! I can't even imagine doing that now. No clean sheets, no pillows, no vegan food, no private toilet, no bathtub and bubble bath, all that noise! We spent the weekend racing, unless some important and unrepairable or replaceable part of the car broke. It's amazing how generous other racers were. Jack was a perfectionist and wouldn't race for money until everything about the car was right. We won lots of trophies. I can hear the engines, see the flames from the funny cars and fuel dragsters at night, and smell the gasoline and the nitromethane. It was exciting and there were interesting people at the track, famous drag racers and other minor celebrities. Google 'Jungle Pam' for a taste of those. I saw Pam reading in their trailer one time and wondered what she was reading. But she was famous, so I didn't have the nerve to ask. We did this for two or three years. And then we got married. Saving for a house seemed more important to me than plowing all our meagre money into replacing a $500.00 transmission or other expensive part. So we sold the car. But we have the photos and the memories and I still won't drive a car with an automatic transmission. Three Corvettes later, we now drive a VW Jetta Clean Diesel standard shift. But I can still hole shoot most people at red lights or drop a gear or two into corners. It's second nature to me and it helps keep the reflexes sharp. So, if the grey-haired woman next to you at the stop light is revving her engine, it's probably me! Say hello - to my dust! !